Recently there has been a spate of comments on declawing discussions, that there is a new way to declaw cats by laser, which doesn’t involve amputating any bone. This is untrue! One person said that she had been told that it was a wonderful new and to be recommended procedure which only lasered away the nail and nail bed. By spreading this untruth without doing any research into it, how many cats claws has she endangered? How many cat owners will phone their vet and book their cat in to be declawed? How many vets practices will explain that there is no new procedure? Will they explain that in a cat the nail bed is the last phalanx of the toe, the entire bone is the nail bed. It contains claw cells and if not removed the claws grow back painfully crooked. A cat’s claws grow in layers from germinal (epithelium) cells into which each claw is deeply embedded. Describing a cat’s claws as nails is muddying the waters; it makes them sound like a human’s nails. Our nails are merely covers to protect our finger ends, they are not embedded in bone like a cat’s nails/claws. Removing a human’s nails wouldn’t affect the finger bone at all because our nails are just plates which grow from cells in the lunula (the half moon) and are anchored by skin. Unfortunately some people think that a cat’s nails are the same as a human’s and can be removed without it affecting the bone. This is untrue! Front declawing a cat by any method is the amputation of the TEN last toe bones. Thankfully declawing the rear paws isn’t very common but it does happen and that cat suffers EIGHTEEN amputations! I have watched The Paw Project video and I urge anyone who hasn’t seen it to watch it on Netflix if it hasn’t had a showing in your area. The film showed declawed big cats before and after their paw repair surgery and pictures of small declawed cats. Yes, it was hard to watch in places but we who are fighting this cruelty, need to see this if we can. It also includes showing the Paw Project vets succeeding in having declawing banned in eight Californian Cities, their joy and relief at winning those bans was wonderful to see. What was horrible to watch was the vets who didn’t want the ban, arguing against it, I was shocked that those people who trained to help animals were so desperate to keep such cruel surgery legal. The Paw Project are committed and determined to educate about declawing, to help as many declawed cats as they can and ultimately to get declawing banned. This entry was posted in Declawing and tagged Cat Declawing, declawing cats, laser declawing by Michael Broad. Bookmark the permalink. Excellent article. Thanks as always for spreading the truth! Declawing is illegal in Australia. Why anyone would abuse a cat like this is beyond me. If you cannot cope with a but of scratching of your precious furniture, then do not get a cat. It is an American “thing”. Part of their culture as I am sure you realise. Thanks for visiting, Susan. Any future comments you make will be published immediately. A dreadful and cruel part of their culture. Hunting with packs of dogs was part of our culture but we got it banned and we will get declawing banned one day too, no matter how long it takes. 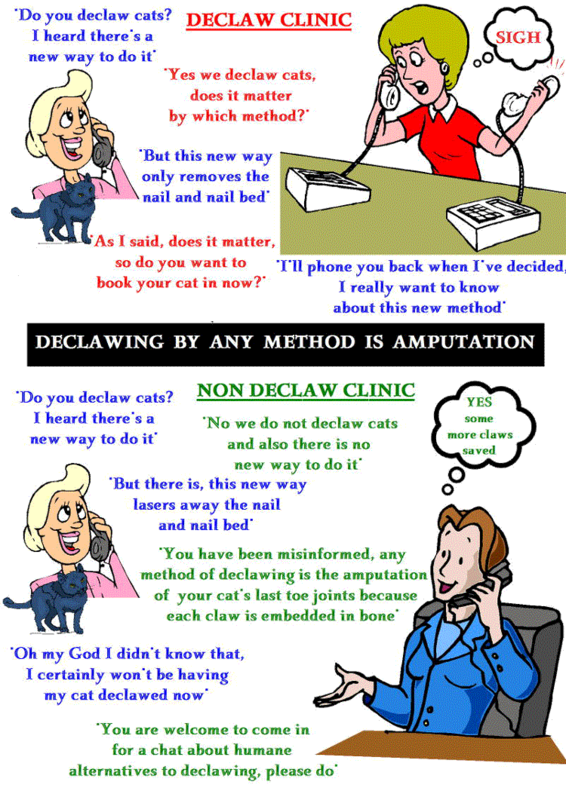 Declawing is illegal or considered extremely inhumane and rarely done in 39 countries now, I think Australia is like our England and your vets never declawed even when it was legal. It’s good to have you here Susan to help educate the Americans who think declawing is acceptable. In Australia declawing isn’t actually banned but it is considered extremely inhumane and very rarely done. Well it should be banned. It needs to be world Wide i just dont understand it all. Where do these cruel lies come from? Is it vets or techs spreading their poison trying to get more business by pretending to have discovered a new way to rob cats of their toe ends, or is it “owners” trying to convince themselves and others that they’re not subjecting their cat to a devastating unnecessary procedure? There will be those all too eager to believe, or make themselves believe, just so they can get their cat to the vet and have her declawed, then later they can shout loudly that they were misled, how could they possibly have known that their kitty’s toes would be hewn off when Mrs So and so down the block told them there is a new way that only “takes the nails and nail bed” – but they like the result anyway. I’m sick of all this cr*p, it’s legalised cruelty which people actually pay the perpetrator to commit I feel so sorry for the many people in the US who hate declawing, I wish their fellow countrymen and women would get the rose tinted glasses off and realise cats should NEVER have this disgusting procedure foisted on them in any way, shape or form. Loved the poster, it tells the story in pictures as always, another valuable one to share. Its sick and stupid how people i.e Vets and whoever is gaining from declawing. I really wish and Hope in Canada and United states, and wherever else are still doing it. Its just Cruel and its just as bad as that situation happening with this Cats and kittens in US. I think it is anyway. I just feel so sick and angry over the whole thing. How would they like it, if we cut their hands and feet and not care? Yes it smells of desperation to me, it seems that someone has started this rumour again just when the Paw Project vets are gathering more evidence to show what the outcome of declawing is, the greedy heartless vets don’t want to stop, they will do anything to convince people declawing isn’t cruel. Well lovely Article as always Ruth. I just still think its wrong to declaw/ or clip Nails. I take it like this. How would we like it if we did this to ourselves? We wouldn’t, like it as it would hurt it would be painful. We need our nails, especially if we are being attacked especially women. So I’m in agreement with you, and most people who visit here. I will continue to support that there needs a ban on all Declawing Worldwide. Its wrong, and its Cruelty. It doesn’t worry me if they Scratch on furniture, it is a worry if they do on Wallpaper etc, as being in a Rental Home, but i usually just fix it up by painting over it or putting Plaster on walls. I’m going to soon get some more Cat Scratchers. I just think its just greed to hurt all animals whether they a big or small. I say Shame on all that do this. Thanks Kylee, you are so right, furniture and wallpaper can be replaced, cats toe ends can’t. Good idea to get some more cat scratchers, we have scratching posts and pads in every room for our cats.